Kyoto is the spiritual oasis of Japan. 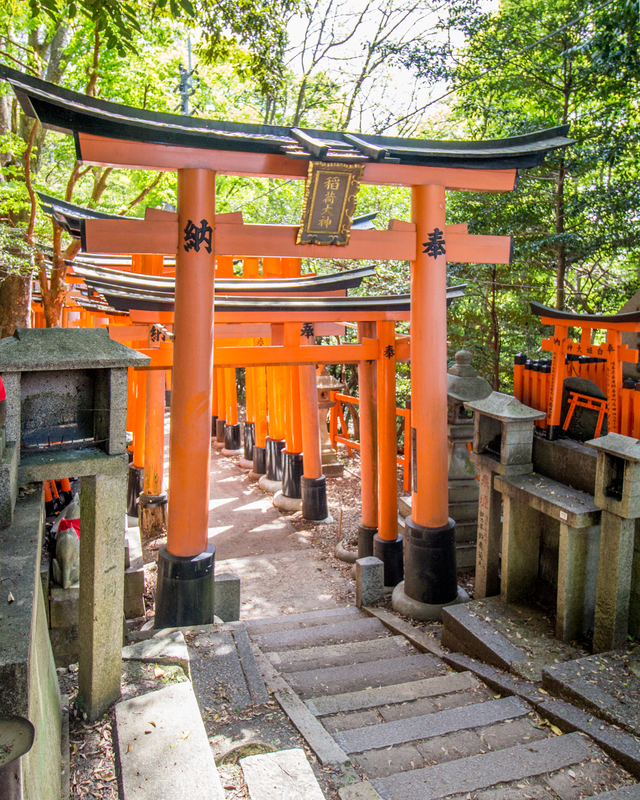 The magnificent facades of its many temples and shrines, and the lush ambiance of its Japanese gardens, captured our hearts. 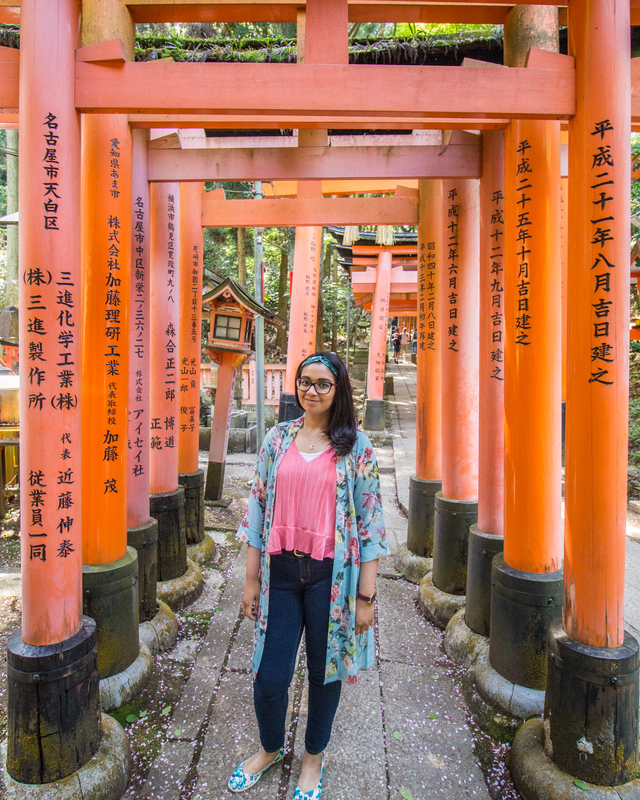 From the ancient streets of Gion where the geishas wander, to the golden balconies of the Kinkakuji temple, every area we explored, we were travelling back in time. This is where we truly experienced the essence of Japan. We spent 2 nights and 3 days exploring Kyoto. From Tokyo, we booked ourselves tickets on the famous Shinkansen bullet train from Tokyo Station to Kyoto Station. Once we arrived at Kyoto Station, we walked to the nearest subway station which would take us to Gion. Gion is the well-known geisha district of Kyoto, and also where you can find lots of temples and shrines. You will notice a lot of women (and occasionally tourist couples dressed up) in the most colourful, beautiful kimonos. They may be locals or tourists who have hired a kimono for the day. In the evenings, you may bump into a ‘maiko’ (geisha apprentice), although with the ‘maiko experiences’ you can buy, she might just be a tourist dressed up. On a small street, in the heart of Gion, is where we booked our hotel, the style of which was based on a traditional ryokan, with our room even having a view onto a typical Japanese private garden. The first afternoon we arrived in Kyoto was rainy with a slight chill in the air. After checking into our hotel, we wandered along the winding, cobbled streets of Gion, towards a large green space that was nearby to us, as per Google Maps. We came across the large wooden outer gates, of the path leading in to Chion-in Temple – a Buddhist temple. From this outer gate, the long, white cherry blossom lined path leads to the main outer ‘Samon’ gate of the temple compounds. Initially, I thought my favourite part of the temple must be this vibrant colorful little shrine within the temple compound. 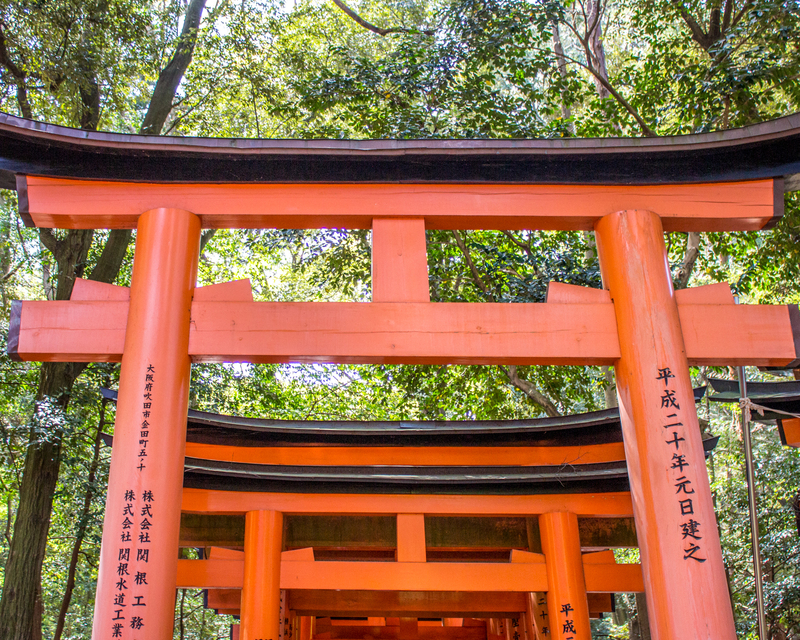 But then we stumbled upon this little shrine surrounded with green, and we decided it was both our favourites! 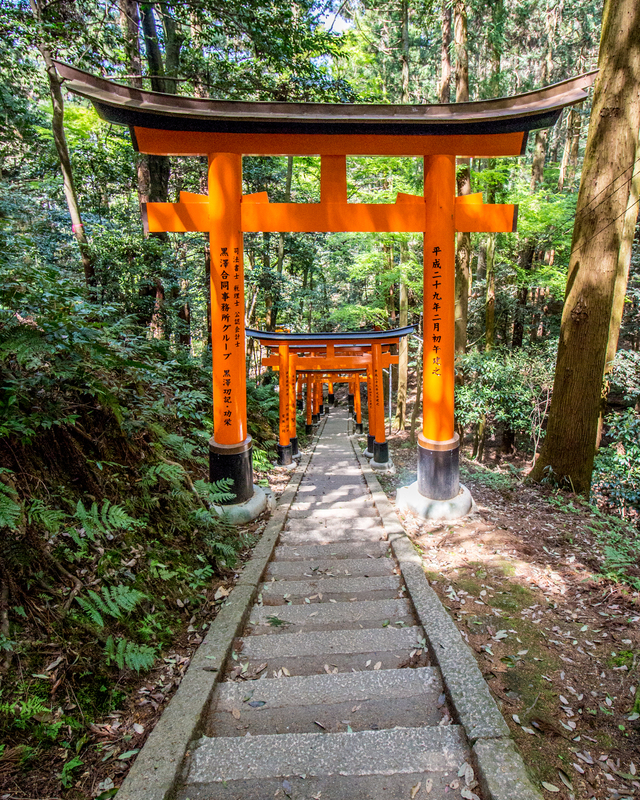 Walking towards this shrine, we were filled with the most serene calm. Usually, we prefer our days to be bright and sunny when visiting places. However, the day we visited this temple was overcast and rainy, making the place look even more beautiful and magical. The foliage looked more lush, the greens were darker and the shrine more mystical. The coloured cloths you see draped across this temple, was made of the most rich, thick satin like material – it was beautiful to touch. Although the serene surroundings silenced us to take it all in with a quiet reverence, we still had the opportunity to take some fun shots! Walking through the Chion-In temple grounds, we came upon the lovely Maruyama Park. I expect this park to be full of cherry blossom trees if you visit it in the right season. The park has within it lovely little cafes and restaurants. If you look up these place names on Google Maps, you will see that they are all near each other and the compounds are interlinked. This was perfect for people like us, who enjoy ambling along until we see crowds of people, usually suggesting that we have stumbled upon our next attraction. The Yasaka shrine sits facing one of the main streets in Gion – Shijo Dori. Walking up the Shijo Dori towards the shrine, you will be faced with views of this magnificent orange-red structure, with tourists clambering to get their best shots of the fiery shrine. You can see here that we happened to find a quiet time. If you time your shots according to the traffic lights, you might even be lucky and get one without any vehicles! These lanterns are donated by local businesses, so the writing you see on them are the names of the businesses. These photos may be able to convey the sheer beauty of the glow from the lanterns against the darkening sky, but unfortunately they are unable to show the way they sway in the breeze, tinkling away when they bump against each other. The following day, we celebrated Jonny’s birthday by visiting the beautiful bamboo forest in Arashiyama. A bus from the center of Gion easily got us to one of the main streets in Arashiyama, where you can either follow the signs, Google Map or crowds, to enter the bamboo forest. This was the first bamboo forest we’d ever visited, so we were pretty excited! The forest itself does not have any gates or tickets, so can be visited at any time of day! Of course if you are wanting those precious crowd free shots, you should aim to be there by 6am. We decided to have a little bit of a lie in (as it was Jonny’s birthday), so by the time we did arrive, it was peak time and time to join the masses. If you are like us, and enjoy your sleep, don’t worry – just remember that patience and a bit of skill can still get you some fairly people-free photos. The forest wasn’t as big as we expected. So, we took the opportunity to pay a small fee, to enter one of the gardens within the forest. This had some lovely cherry blossoms, ponds and other flowers. Do you spot the fishes in the lake below? As it was a special day, we had to try and capture some special shots of us! In Arashiyama, we had our first taste of cherry blossom ice cream! Unfortunately we have no photos, but take my word for it, it was different to anything I’d tasted before, and very delicious! 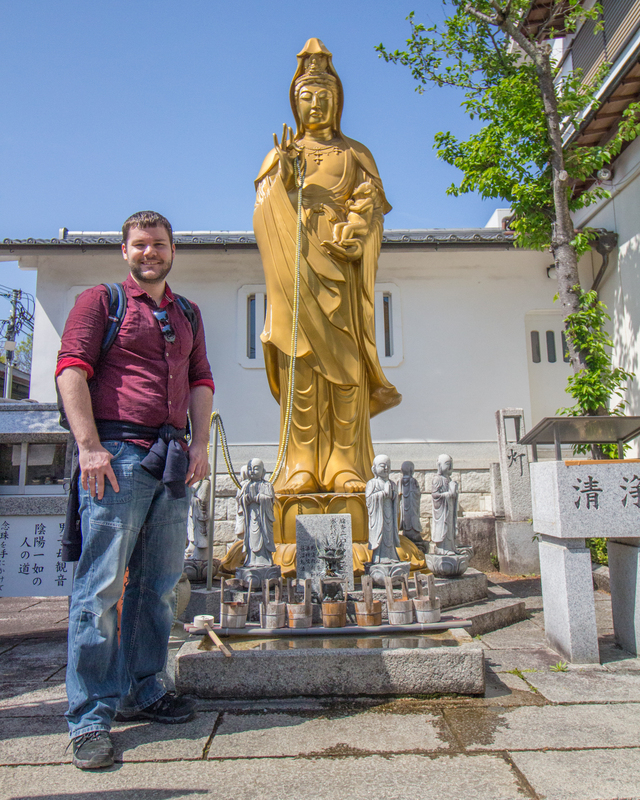 Once we’d finished, we took the bus back to Gion, where grabbed a birthday lunch first. Then onto another bus to our next destination! Kinkakuji temple is a Zen Buddhist temple whose top two floors are made of gold leaf. The temple was the retirement villa of a shogun, who made it a Zen temple after his death. It was burned down 3 times in its history, and its present structure was rebuilt in 1955. The gold facade makes it particularly impressive to view at sunset, when the sunlight makes the temple shimmer golden, and cast a beautiful reflection in the pond. As you can see, it looks just as glorious from the back. We missed entering this temple as unfortunately it was closed by the time we caught the bus back to Gion, walked to the area and ran up the hill to get to it. However we still got to admire it from the outside. That classic shot you’ve probably seen on Instagram, of the pagoda shot down an alleyway in Kyoto, is that of Hokanji pagoda, just down the hill from the Kiyomizu-dera. We got to watch an absolutely stunning sunset in the direction facing the pagoda from the top of the hill (sorry no photos on the sunset!) However, this is what it looks like in the dark (and another one during the daytime). 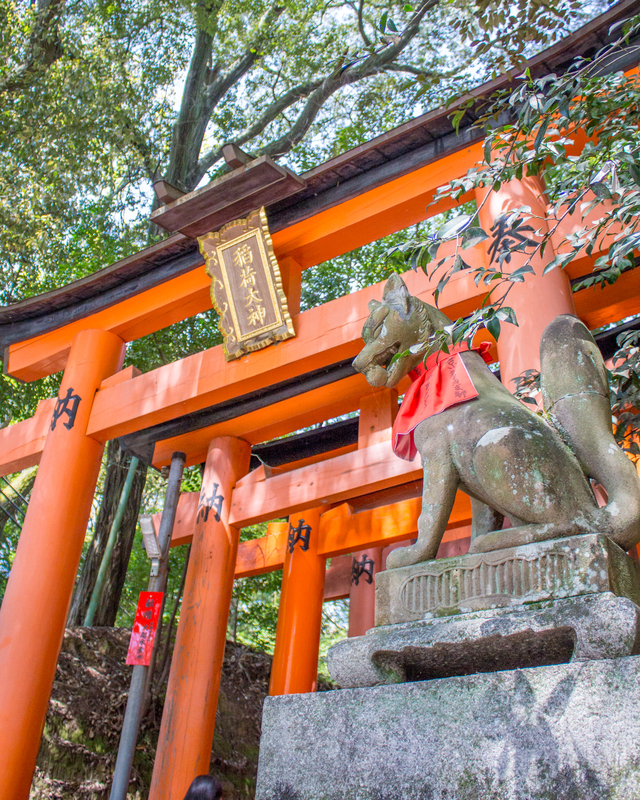 Last, but most definitely not the least, is THE iconic sight of Kyoto, known world over – the Fushimi-Inari shrine. To get here, we caught a train from Gion to Fushimi-Inari Station. On the short walk from the station towards the shrine, we were greeted by lanes lined with food stalls selling everything from crab claws to eels, the smells wafting over to welcome us through to the shrine; souvenirs taking the shape of miniature Torii gates which you could keep as keyrings, wall hangings, chimes. 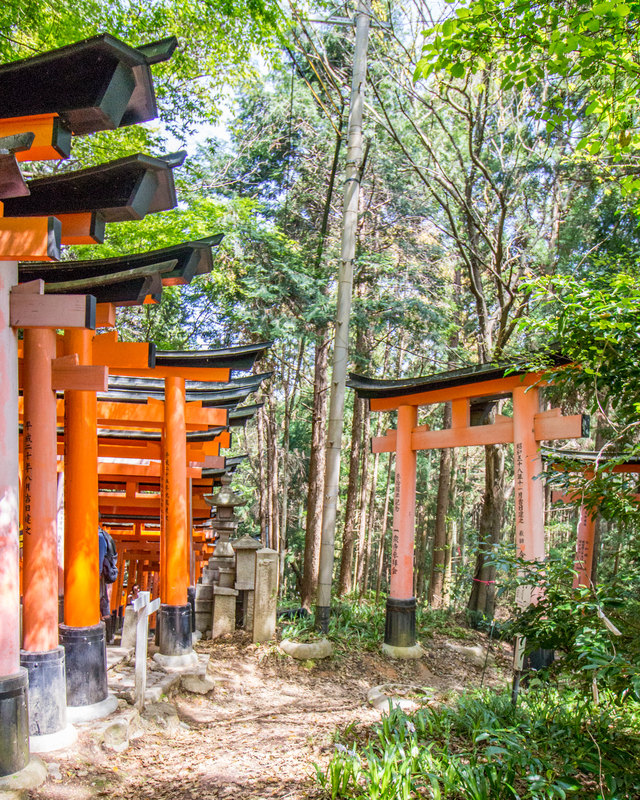 The shrine is one of the most iconic sights of Kyoto and Japan. 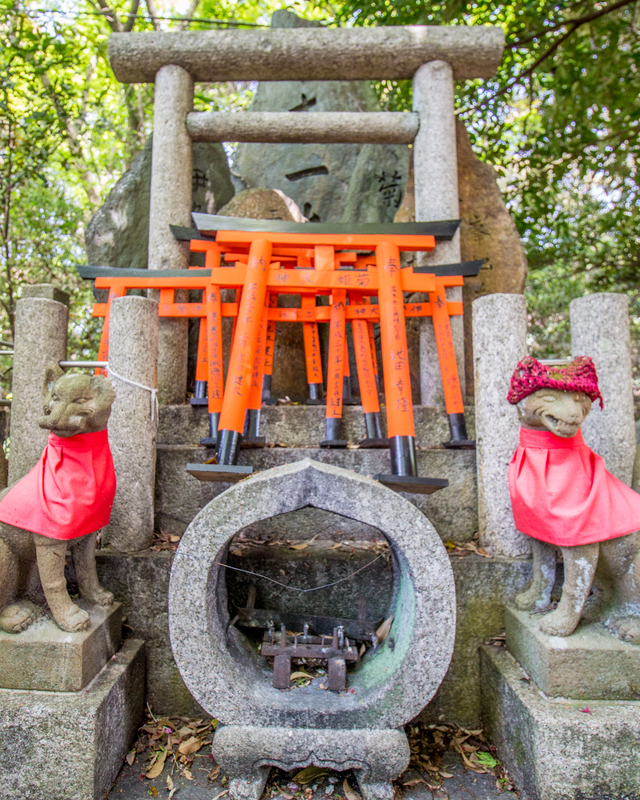 The Fushimi shrine is the head shrine (of many other Inari shrines) dedicated to the god of rice. 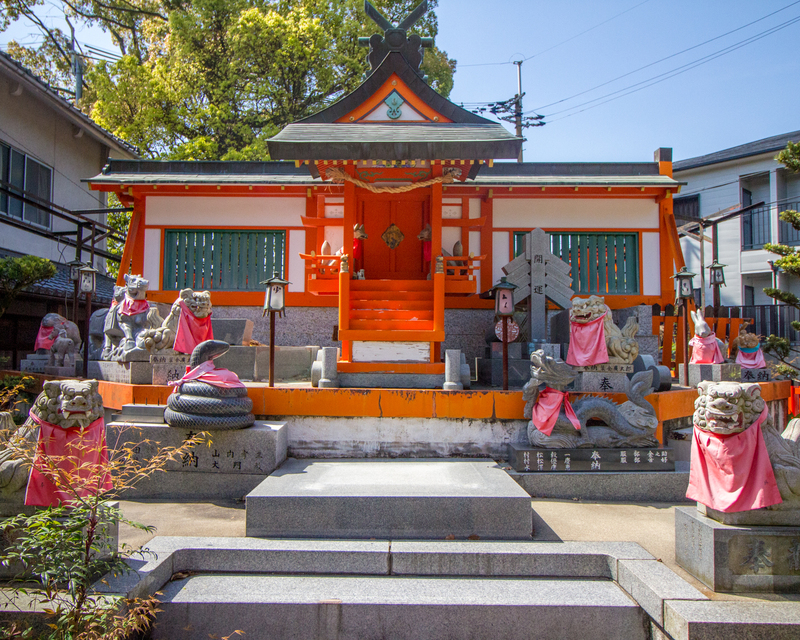 However, merchants have also prayed to Inari as the patron of business. 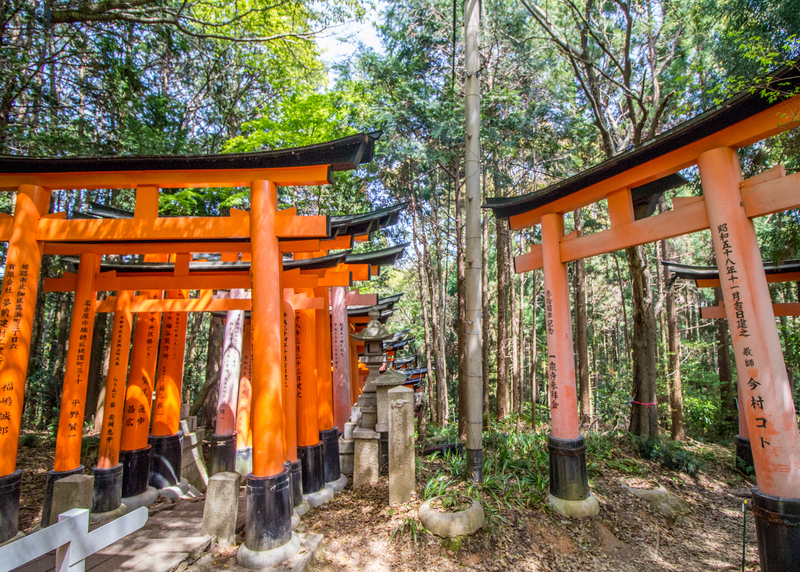 There are over 10,000 of these vermillion Torii gates along the length of the hike through the shrine. 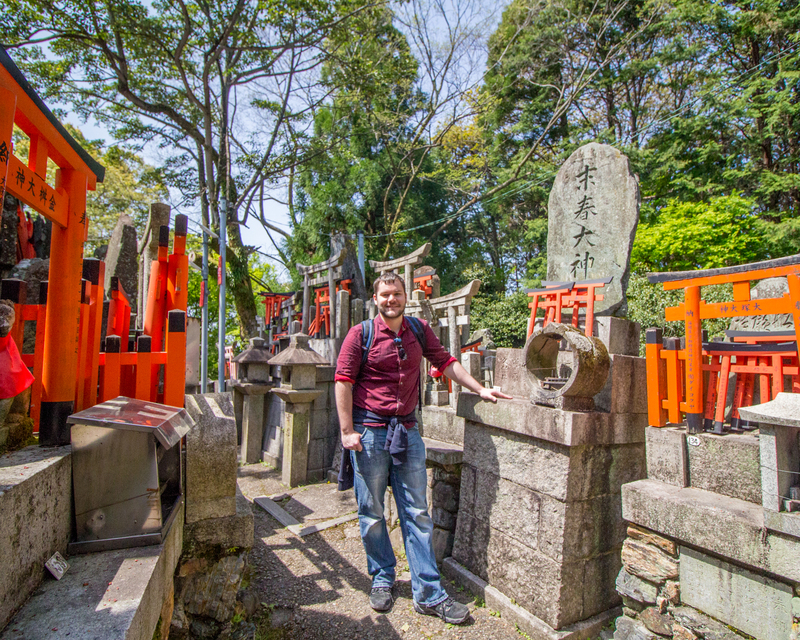 Each of these Torii gates have been donated by a business, and will have their name written on them. 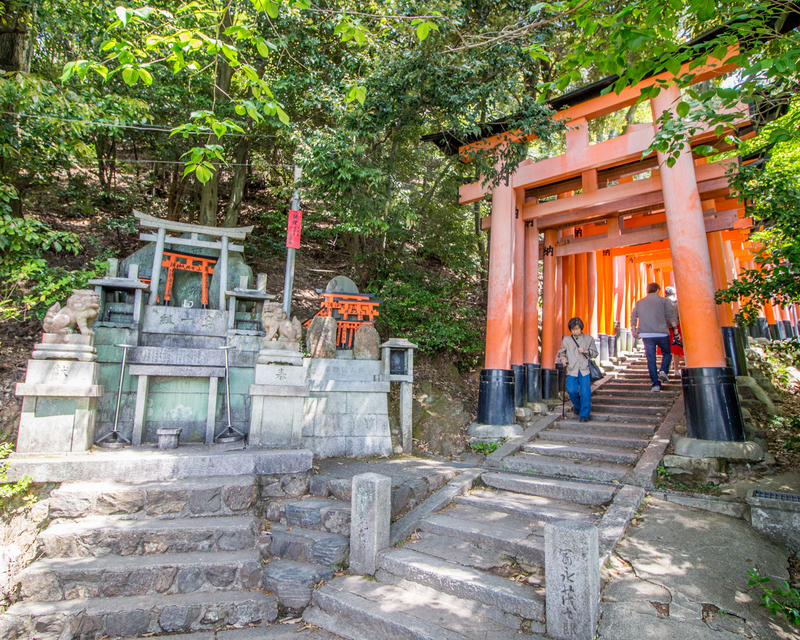 The shrine starts at the base of Mount Inari, and takes you on a trail up the mountain through small shrines and Torii gates. Just when you think you’re approaching the top, you will come across one of these maps to inform you, nop! -not just yet, keep climbing! I took (what feels like) millions of photos all through this lovely hike. I wish I could share them all, but here’s a selection of 15. 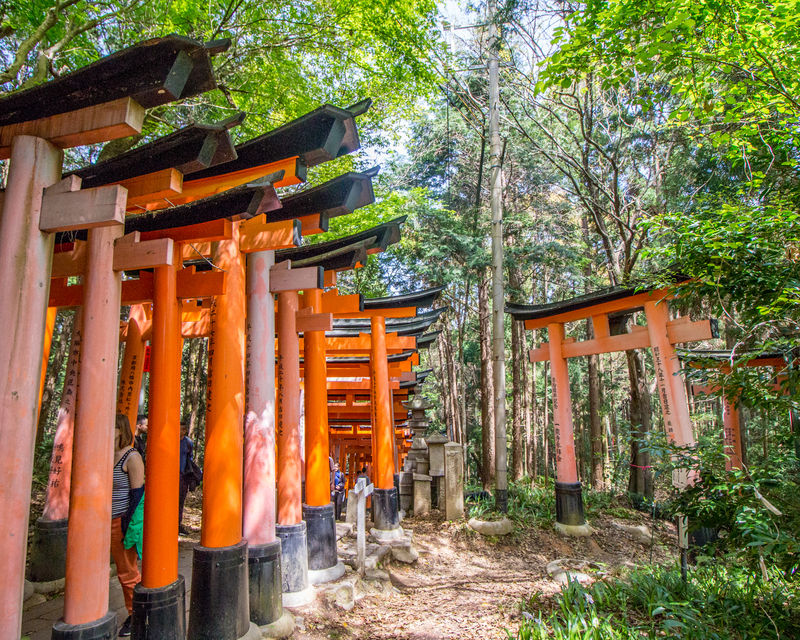 We hope reading about our Kyoto highlights have inspired you to make the trip! Leave us a comment, and let us know your thoughts! 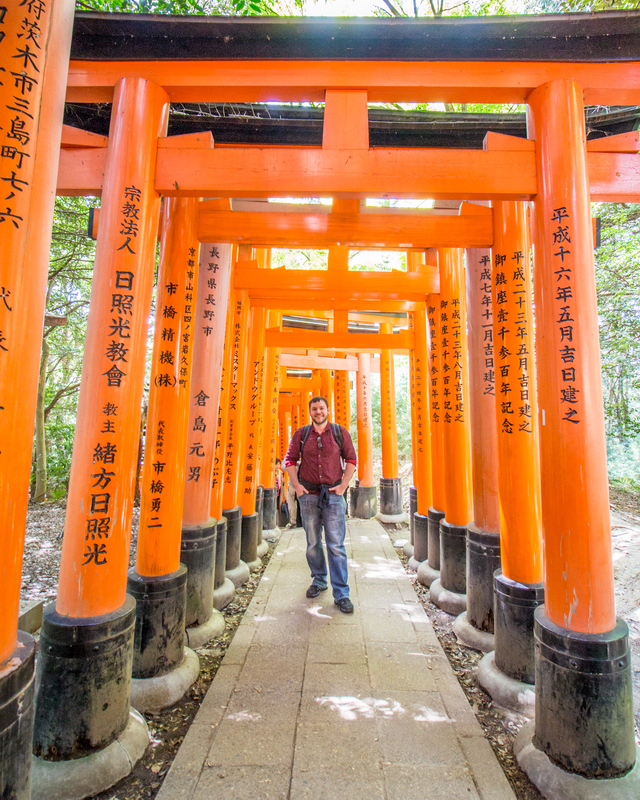 There’s more blogs to come in our Japan series! Follow our blog and @thedjklife on Instagram, to be updated on our travels and blog posts! Hi there I love your post, I write about similar things here in Japan! I hope my posts can give you some new Ideas for new content! Great Blog Post and amazing photos. We just went to Japan for Easter so cannot wait to get my own act together and get my blog up. Thanks for the motivation!!! Thanks so much for checking it out! 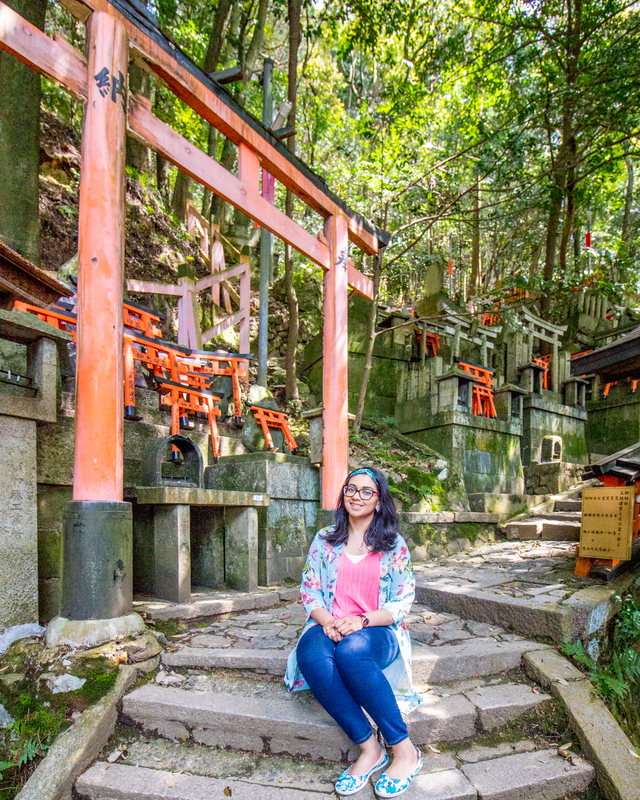 Good luck with your blog – hope you had an amazing time in Japan! I’ve yet to meet someone who hasn’t!